The idea of turning a wheel into an electric motor is smart but the technology behind it is not that simple. In essence what you are doing is turning an electric motor inside out and putting a tire around, or using a wheel and putting an electric motor inside. The difference between Protean in-wheel and say Michelin’s Active Wheel are subtle with both technologies deliver a lot of performance. In-Hub vs In-Wheel. The difference between in-wheel and in-hub can be summarized as in-hub has an electric motor inside the wheel and in-wheel is basically an inverted electric motor in a wheel. Protean’s technology is developed from the military and uses a tank pivoting turret electric motor idea into a wheel. Michelin’s ActiveWheel uses an electric motor that drive the wheel directly inside of it as well as suspension. Car and Driver believes in the potential of in-wheel and in-hub electric motors for electric and hybrid-electric cars. In fact, Protean has demonstrated with much success fitting two of its wheels in a Mercedes Brabus hybrid that delivered an astonishing amount of extra power. The wheels can also be used to help fuel economy and despite their extra weight can be reasonably installed on any car, trucks and buses. Technically Speaking. 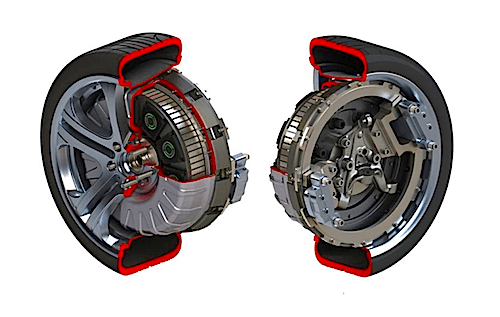 The pros and cons on in-wheel electric motors are interesting and should remind us to what length the automobile industry will go in order to solve obstacles and turn them into working solutions. Early detractors of in-wheel and in-hub technologies pointed to the fact that if a wheel stopped functioning, it would be a lot of dead weight hanging inside a wheel potentially disrupting the driving dynamic of a car. The consequences could be disastrous if it was one of the front wheels, which could pull the car to one side. Protean’s work-around was simple, multiply the amount of coils and magnet, then link them together into a series, effectively turning them into little electric motors within the wheel. This opens the door to a safer and more reliable in-hub tire and could shut down some of the modules in order to conserve energy. Protean says fuel economy improvements are up to 30% depending on battery size and has the highest torque density of any of today's leading electric propulsion systems with its 81 kW, 110 hp and 800 Nm, 590 lb.-ft. torque in each motor. The weight is 31 kg, or 68 lbs. per motor and fits within the space of a conventional 18-inch road wheel. It allows for regenerative braking capabilities, which gives up to 85% of the available kinetic energy to be recovered during braking. According to Protean Electric Chairman and CEO Bob Purcell: “We can create hybrid and electric-drive options on the vehicles that people like to drive,” he said. “We can provide more power, better fuel economy, easier integration and lower cost. The Protean electric-drive system is probably as close as the industry will ever get to a bolt-on solution.” To be named a leader and one of the Most Promising Technologies by Car and Driver means the industry is no longer in the theoretical realm of the electricdrive technology but its direct application. This is an amazing time in the history of the automobile when newer disruptive technologies challenge old intrenched shackles and liberate engineers, researchers and manufacturers to think outside the box and offer us more choice then the all too common, bigger and more power gasoline engine. Congratulations Protean for your Car And Driver nomination as one of the 10 Most Promising Technologies for 2013. What about the effects of all that un-sprung mass? Is that why Michelin’s ActiveWheel has active suspension to compensate for un-sprung mass? I know this reduces drive-line parasitic loses but in a sports car the handling would be terrible. That was the original thought but if you look up the Japanese Eliica with its 6 in-hub electric motor, certainly it shows un-sprung mass doesn't deteriorate high-performance. I would agree with you but lowered gravity apparently compensates for it. Michelin's ActiveWheel also demonstrated its brutal power on a Venturi EV and the results were astonishing. Basically, the walls of the tires were shred to pieces. Maybe this was the idea behind them using the suspension inside? It would be nice to see the same car with both wheels and see the difference. Now wouldn't it be nice if someone could let me do that?